Before browsing the racks for a fresh pair of shades, take a spin at the wheel of good omens (yes, omens) for free holiday treats at Warby Parker. 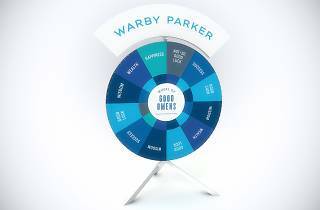 No need to break a sweat when you spin the wheel—whether you land on success, wisdom, or good luck, you'll win a complimentary prize like a fold-it-yourself fortuneteller or tasty treat. Add a little pizzazz to your holiday shopping and take a spin at Warby Parker’s Hollywood and Abbot Kinney locations from Dec. 19 – Jan. 4.